It might seem surprising that the only information to be found in the ‘biography’ section of apparently self-fixated German filmmaker Michael Brynntrup’s website is contained in three cryptic lines: “Identical twin brother stillborn. Since then studies in Philosophy. The artist lives and works.” Yet these terse snippets of data offer a surprisingly complete account of Brynntrup’s background as relevant to his films. 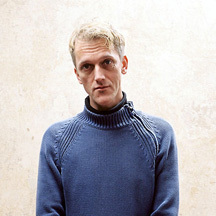 The “twin” is perhaps conceptually echoed in Brynntrup’s frequent use of his own image – doubled, multiplied, objectified, at once him and not him: an epideictic construct through which he can playfully mingle selective autobiography with frequently mischievous, always questioning performative variations. 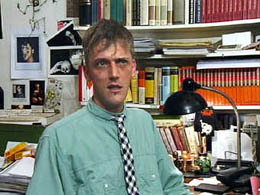 But the twin was born dead and, often, death itself haunts Brynntrup’s films, sometimes dogging works that don’t explicitly dialogue with it like a macabre shadow – a relationship already stated in one of his first films, Der Rhein: Ein deutsches Marchen (The Rhine: A German Fairy Tale) (1983). Constructed from Brynntrup family photographs, home movies and other archive footage, it superimposes images of violent warfare with idyllic country outings from Brynntrup’s childhood, the battlefield and site of play geographically linked (“Where I come from”, quips an opening title card, “everyone stays at home. Except to go on holiday or to war.”) This doubled reality of play and death is joined in remembering another relative who died too young: an uncle of Brynntrup’s killed at age 18 in the closing days of the war. While it would be a very grave error to ignore the specific historical context of Der Rhein’s subject matter, its expression is quintessentially Brynntrupian: playfulness shadowed by death. 20 years on and “playfulness shadowed by death” is still central in Brynntrup’s feature length E.K.G. Expositus: Die offentlichen und die kunstlerischen Medien (E.C.G. Expositus: The Broadcast and the Artistic Media) (2003). Not so much a self-portrait as a meditation on the self-portrait and its relationship with the public gaze, its form could be described as cumulative. 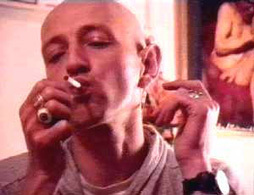 In devouring five entire previous shorts from the ’90s, as well as numerous clips from earlier Brynntrup movies, E.C.G. appears to have grown organically out of what came before it, at once a sort of creative stock taking of Brynntrup’s career to date and a projection of his fascination with the narcissistic self-image into a newly vertiginous interplay of reciprocal mirrorings. The planes of reflection are, on one hand, the media-gaze on Brynntrup’s films and, on the other, those same films’ look into Brynntrup’s private life. Or, more accurately, his careful arrangement of his private life into films for public consumption – films that are, as Brynntrup admits, less private than they appear. Rather than offering the viewer intimate access to Brynntrup as a private man, in E.C.G. he describes the use of his image as a ‘medium’ through which he can explore universal themes. This is certainly true of such earlier films as the religious satire Veronika-Vera Ikon (1986) (“Jesus as Michael Brynntrup!”) or the brilliant exploration of the elusiveness of categorising an identity, Die Statik der Eselsbrücken (The Statics: Engineering Memory Bridges) (1990), which is much quoted in E.C.G. The Brynntrup of E.C.G. seems primarily concerned with embodying the Artist under interrogation, engaged in a mild game of self-justification, albeit one that commendably avoids self-pity or self-righteousness. Although he rather glibly touches on the subjects of love and faith – and, as will be discussed later, typically pauses for a longer and more serious contemplation of death – it is his image as artist and, even more, his image en soi that are really celebrated: a fascination of apparently dubious universality. For all its wittiness and sophistication, E.C.G. fails, unlike The Statics, to seriously question the impish Brynntrup’s persona which does occasionally come over as gratingly bland in the course of such relentless overexposure. Yet this blandness has a part to play if we take the filmmaker’s onscreen presence as the ‘mediumistic’ function that he claims it to be. Even the opening titles attest to Brynntrup’s self-objectification: “A Film by … a Filmmaker”. His very two-dimensionality serves E.C.G.’s highly intricate imagistic mutations and multiplications with an efficiency that a more rounded or ambiguous centre of attention would hinder. His constant, disingenuous insistence on an appearance of transparency facilitates the precision demanded in the construction of a complex as dense as E.C.G. It is possible to view E.C.G. as the elaboration of one of the four short films Brynntrup integrates into its structure, Herzsofort.setzung II (autogene Manipulationen) (Heart.Instant/iation II (Self-Generated Manipulations)) (1996). This short follows an image of Brynntrup for more than seven minutes as it is subjected to numerous visual alterations and manipulations by being passed through a variety of different media. Around this core of irrepressible imagistic outpouring he has created a tortuous labyrinth of repetition and sometimes subtle recontextualisation that allows the films, interviews and fragments here assembled to gain in weight and meaning as E.C.G. progresses. This is not the first time that Brynntrup has conceived a narrative that builds on a periodic return to points already traversed: his elegant Plotzlich und Unerwartet: Eine Deja-Revue (Sudden and Unexpected: A Deja-Revue) (1993), graced by the cult presence of Udo Kier, is a charmingly limpid exercise in looped time. Yet whereas the earlier work’s circling plot was arguably its sole raison d’etre, E.C.G. is infinitely more complicated, acquiring layers of resonance as it progresses. It opens with a brief short film comprised of just one shot, Selbsportrait mit Kronleuchter (Self Portrait with Chandelier) (2003), which announces E.C.G.’s theme of self-examination. It sees Brynntrup, clad in the bathing cap and trunks familiar from The Statics, as well as his trademark tie, entering and exploring the workroom in his apartment with the furtiveness of a burglar. The room is dark and the only light comes from a chandelier which he holds like a torch. This comical prelude uses the exploration of private space and its objects to mirror the process of self-exploration, an approach that he put to far darker and more elaborate use in his eerie early masterpiece Musterhaft: Das Ende, ein Intermezzo (Exemplary: The End, an Intermezzo) (1985). What is significant and rather curious about this otherwise slight prologue is the relative normality of the space being explored compared to the buffoonishly unworldly figure of the intruder. One might have expected the opposite, a more ordinary persona investigating a somehow threatening or disorientating space. Brynntrup’s presence is made even stranger by his decision to subtly alter the shot’s speed, interspersing a general speeding up of the image with barely perceptible freeze frames, significantly heightening his character’s cartoonish quality. What this little vignette achieves is a winking abjuration of falsely pompous authoritativeness through the suggestion that the arch-subjectivity of the following investigations originates in an eccentrically alien source. This possibility is again taken up in one of the interview scenes when Brynntrup is asked if he has ever questioned his own sanity. If these scenes offer a wry and even humorously despairing comment on the vulnerability of an artist coming into contact with a sensation hungry public, they do so without dodging the artist’s responsibility for in a way desiring his predicament. The cause and exact nature of the accident is, and remains, unknown and unreported but the media is fervid to broadcast pictures of the victim’s damaged face. If the ‘cause of the accident’ can be read as the creative process, or at least the reasoning behind it, and, to an extent, its mechanics, then much of the rest of the film can be seen as examining ‘the cause of the accident’. The narrative then flashes back to Brynntrup in his flat six months earlier, agonising over how to start the script of a new film that he has been awarded a grant to make. As he searches his notebooks, images from earlier films are summoned up. His musings are distracted by the visits of two television crews, one German and one British, to interview him. He offers his thoughts on his work and his approach to cinema and art in general. These scenes are intercut not only with the four short films that unfold within this structure but also with media coverage of them on TV and radio shows. Finally, all of these elements are layered in a dazzling recapitulation. The film can be divided up into sections involving Brynntrup looking at and processing his own life: Brynntrup propagating his own image as playful æsthetic object; the media gaze on Brynntrup both as interviewee and in clips from his films mediated by the framework of TV commentary and re-editing; and Brynntrup’s return gaze at the media enacted both through his camera-wielding insistence during interviews that, “If TV shoots me, I’ll shoot TV”, and his reintegration of the film clips excerpted for television, along with their media commentary, into the context of a work of his own. The baroque interplay of these gazes is perhaps best encapsulated in a group of three compounded images. First, there is a low angle of Brynntrup’s face taken with his own camcorder which he holds as he goes to his apartment door to admit the TV crew. Stopping in front of the door, a mirror on the ceiling becomes visible, vertiginously doubling his image. On top of this already split frame, he superimposes another angle of the same content, this time a medium-shot of him in profile standing before the door with his camera in hand. Then he dissolves to an almost identical angle, again of himself in profile, carrying the lines he is speaking over the dissolve in mid-sentence to indicate temporal continuity. With the reflection, he reconfigures the most banal of home-video shots by the startling intervention of a detail of Wellesian ornateness that doubles a gaze already made double by Brynntrup filming himself: that is, splitting his ‘gaze’ between his eyes and his camera. What he – and the viewer – is expecting is the arrival of another camera gaze: that of the documentary crew. Given that the mirror shot opens the scene, the misapprehension that the whole scene will be taken only by cameras operating within the diegesis may arise. The profile angle introduces a point of view external to this expected ‘duel’ of cameras. Such a switch of viewpoints is unexceptional in itself. What is striking is that, instead of cutting, Brynntrup chooses to superimpose this image on top of the mirror shot. The simplicity of the first shot’s self-controlled documentary viewpoint is undermined as, with the appearance of the mirror and then the profile shot, alternative angles of approach to the subject cluster around it. This visual cluster manages to contain: Brynntrup’s self-image (the intended effect of his camcorder shot); his mirror image (the reflection) that might be a Cocteau-esque intimation of mortality (readers familiar with Brynntrup’s films will know that death’s presence is so ubiquitous to them that this supposition is not nearly as far-fetched as it might sound); his relationship with the public gaze (the imminent arrival of the TV people); and the broader frame of the film that encompasses all of these visions (the profile shot), that is at once generated by Brynntrup and tellingly separate from the ‘Brynntrup image’ onscreen. Yet the dissolve to the slightly different angle of the profile shot implies that this ‘framing consciousness’ is also unstable and, especially in bridging the dissolve with a line of dialogue, distances it from an objectively documentary (or mocumentary) perspective. Indeed, in these three shots Brynntrup offers what must be the wittiest disavowal of documentary expectations since Federico Fellini’s sublimely cynical shot in one of the mock documentary scenes in Fellini’s Roma (1972), wherein the point of view of a photographer framing a tourist’s portrait suddenly takes off into a sweeping crane movement, making nonsense of shot-reverse-shot logic. Brynntrup’s tendency for objectifying self-æstheticisation is, of course, chiefly manifest in Heart.Instant/iation II’s torrent of mutating self-portraiture. His filmic – as opposed to spoken – self-reflections are concentrated into three sections of E.C.G. : the rapid tour of his diaries early in the film and two of the pre-existing short films, Aide Memoire: Ein schwules Gedachtnisprotokoll (Aide Memoire: Gay Document for Remembering) (1995) and Loverfilm: Eine unkontrollierte Freisetzung von Information (Loverfilm: An Uncontrolled Dispersion of Information) (1996). The diary scene is practically also a short film in itself. It represents an idea for the project Brynntrup has been commissioned to make that occurs to him in the flash-back immediately after the first hospital scene. Opening with the filmmaker setting up its first shot, one of his desk, it proceeds to a close-up of his hand drawing storyboards for its opening shots even as they appear on the scree: images of the clock on his desk, of the opening title. Then it cuts to pages from his diary, neatly written and full of pictures and diagrams, which are filmed in negative. It flies through these in a fiendishly dense montage interspersed with images from his previous films, notably The Statics, which appears in its entirety, or perhaps only almost in its entirety, but running at many times its original speed. As a crash course in Brynntrup’s obsessions, its speed is such that it sometimes only barely clings to comprehensibility and poses a particular challenge to viewers unacquainted with his previous work. However, a sense of what he is about emerges; an interest in scientific or pseudo-scientific categorisation becomes apparent, as does his fascination with death as evidenced by the macabre proliferation of his pet fetish: skulls. Along the way, comments arise about “tidying up his love life”, an operation he undergoes and feeling “at odds with God”. This reduction of more than a decade of thought and creation to near gibberish might appear wanton until it finds an echo in Loverfilm’s approach to the director’s sexual history. A rapid, 20-minute list of Brynntrup’s past lovers, it sprints through 20 years of gay history, matching names to images of young men whilst slyly posing questions about both the viewer’s right to be watching such a private document – one that pointedly includes invasions of privacy – and whether or not the images actually depict the people they are supposed to represent. What it has in common with the diary scenes is the reduction of a significant and intimate aspect of Brynntrup’s existence to the status of a rapidly scanned list. In filming his diary, he brings his artistic/intellectual development to the verge of unintelligibility before, in Loverfilm, proceeding to render his love life emotionally meaninglessness. Both gestures are violently self-objectifying. Indeed, the final shot of the diary section is a clip from Brynntrup’s Cain and Abel showing the Biblical brothers making a sacrifice to God. Is Brynntrup offering up the content of his life as a sacrifice through the way he presents his diary and in Loverfilm – and, if so, a sacrifice to what? To the detachedly ‘mediumistic’ self that supposedly allows the viewer to read him- or herself into Brynntrup’s experience? That certainly stands as one possible reading. But the contrast between these two sections and Aide Memoire suggests a more existential set of implications. Aide Memoire is an unassumingly tender documentary in which photographer Jurgen Baldiga talks to Brynntrup about coping with AIDS. Baldiga’s talking head is intercut with still pictures of him close to death (he died in ’93) and apparently unstaged footage of a deranged, possibly alcoholic woman in Brynntrup’s courtyard screaming threats and abuse at the filmmaker who is hiding, filming, in his flat. This woman’s threatening behaviour represents Brynntrup’s own vulnerability in the face of mortality. Although the affectingly delicate Aide Memoire consciously resists heaviness, choosing instead to emulatively celebrate Baldiga’s courageous and even playful attitude in the face of his fate, it is nonetheless the only overtly serious section of E.C.G., the only time Brynntrup wears his heart on his sleeve. As such, it provides the film with a much-needed emotional centre. The self-image, one’s thoughts and love life are, Brynntrup might be suggesting, all fair game for pulping into clever, if emotionally superficial, intellectual conceits. They are, after all, so fragile (the filmmaker’s ruined face in the hospital) and fleeting (the lists of diary dates and lovers that are replaced with dizzying speed). But death, and one’s attitude towards it, are an absolute, perhaps the only one, and is thus viewed with a respect unmerited by any other aspect of life. During E.C.G.’s recapitulative final minutes – and so fleeting that one is almost tempted to say hidden among E.C.G.’s recapitulative final minutes – there occurs what is perhaps the film’s most telling moment. In interview, Brynntrup confesses, “When I find something inside myself I’d rather not discuss, I try to find a way.” In a small frame-within-the-frame that occupies the bottom corner of the screen throughout much of these closing scenes, images from Loverfilm appear only to zoom back into the large image and quickly disappear. If, unlike The Statics, E.C.G. fails to question Brynntrup’s onscreen persona, this apparently passing observation introduces an element of self-doubt regarding his playful practices. The shots of his ex-lovers vanishing, coupled with the spoken admission, might imply that the obliqueness of his cinematic approach to them stems from an inability born of discomfort to confront them more directly. This obliqueness also inflects his presentation of his past in the diary scenes and maybe even his relationship with death in Aide Memoire. Although death is examined directly, it is done so not through Brynntrup but through his friend. This is not to suggest that Aide Memoire is anything less than a sincere tribute to Baldiga, but, as the images of the mad woman suggest, Baldiga’s end could perhaps have been Brynntrup’s. The filmmaker’s empathy with the photographer even extends to appropriating his æsthetics. Whereas for Brynntrup, at least in E.C.G., the image is an endlessly manipulable element in an irreverent game of recontextualisation, Baldiga sees his photographs of his dying friends as a part of them that will remain after they have passed on – a solemn faith in the image that couldn’t be more different from Loverfilm’s nihilism. Yet Brynntrup’s images of Baldiga in Aide Memoire seem imbued with this faith also, as if he were sharing in the sufferer’s work of salvaging portraits from imminent oblivion. This renders Brynntrup’s approach to mortality in E.C.G. doubly oblique: not only is it another man dying, but he is viewed through another artist’s perception. The diary, Aide Memoire and Loverfilm make clear that the largely private dialogue between Brynntrup the artist and his subject, Brynntrup the man, is a complex and mostly inaccessible affair belied and perhaps shielded by the extroverted public Brynntrup. It is this Brynntrup that is very much in control during the scenes devoted to his relationship with the media, with the public gaze. The importance of the public gaze is made clear almost from the outset. The diary section illustrates the filmmaker’s idea for a script that he has been desperately trying to dream up. The scene just prior to it shows his writer’s block and its sudden end caused by a rush of inspiration during a phone call from a TV station proposing to do a television portrait of him. This immediately implies a nourishing connection between the artist’s creativity and his media visibility. In one of the interviews he describes his relationship with the media as a “Ping-Pong” movement of mutual interrogation. This back-and-forth is ingeniously inscribed into the film’s structure with its repetitions and recapitulations that snowball in resonance as E.C.G. gathers speed. Its oscillating, discursive form refuses to take sides or draw explicit conclusions in the often contradictory duels between Brynntrup and television. For example, he criticises TV for always selecting the most sensationalist clips from his films, declaring that “excerpts lie” and calling for his works to be screened only in their entirety. Yet it cannot be lost on him that not only does he frequently include clips from earlier films in E.C.G. but that in Loverfilm he reduces his love life to a series of sometimes decidedly sensationalist ‘film clips’ that very possibly do lie quite deliberately. Describing the fruitful patterns of interdependence and contradiction that form between artist and public, as well as between the public and private figure of the artist, is E.C.G.’s great achievement. This tortuous maze of a film is without exit or resolution, forever circling back on itself. Even as it concludes with the injured and possibly dying filmmaker back in the hospital operating room, his damaged state is contrasted with very healthy, naked male couples making love while surreally present by his bedside. Life and death, public and private, truth and falsehood, media and artist, self and image, image and image, me filming you filming me … And at the centre of these overheated circuits that buzz with an almost impersonal creative energy is Michael Brynntrup – perhaps more specifically a conductor than a medium this time.